Virions, single virus particles, are very small, about 20–250 nanometers (1 nanometer = 1/1,000,000 mm). These individual virus particles are the infectious form of a virus outside the host cell. 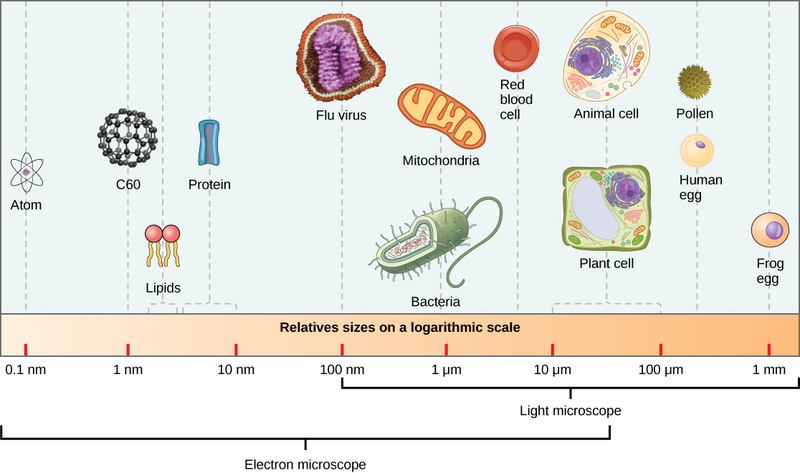 Unlike bacteria (which are about 100 times larger), we cannot see viruses with a light microscope, with the exception of some large virions of the poxvirus family (Figure 12.3). 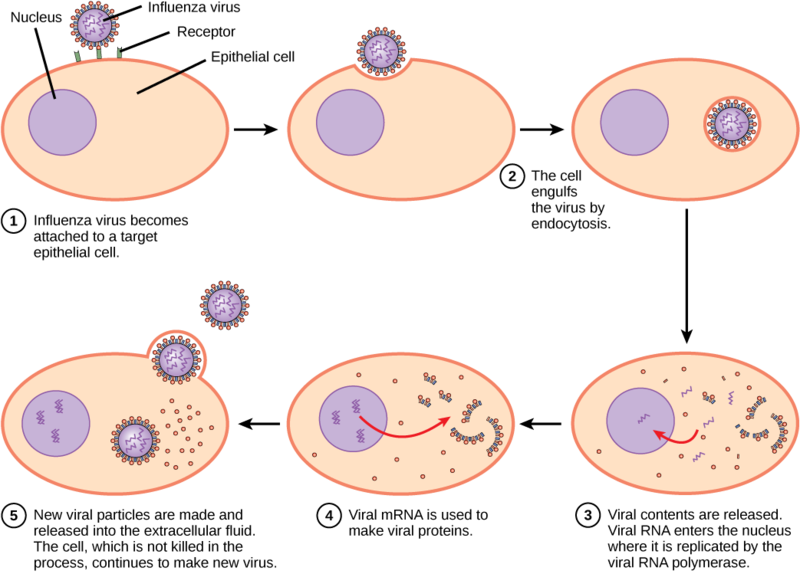 Figure 12.3 The size of a virus is very small relative to the size of cells and organelles. It was not until the development of the electron microscope in the 1940s that scientists got their first good view of the structure of the tobacco mosaic virus (Figure 12.2) and others. 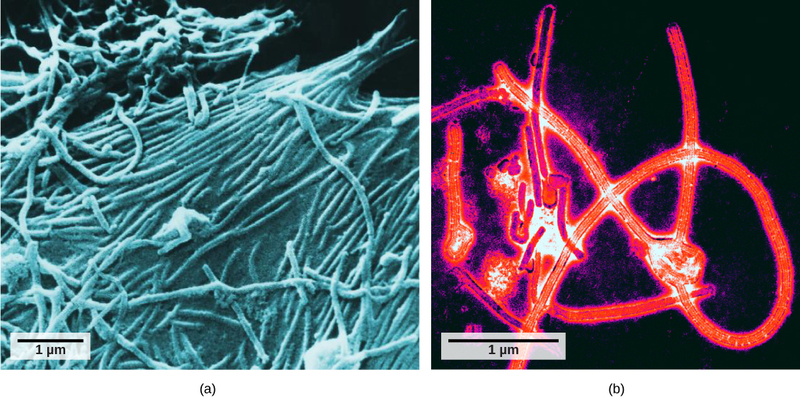 The surface structure of virions can be observed by both scanning and transmission electron microscopy, whereas the internal structures of the virus can only be observed in images from a transmission electron microscope (Figure 12.4). Viruses come in many shapes and sizes, but these are consistent and distinct for each viral family (Figure 12.5). All virions have a nucleic-acid genome covered by a protective layer of protein, called a capsid. The capsid is made of protein subunits called capsomeres. Some viral capsids are simple polyhedral “spheres,” whereas others are quite complex in structure. The outer structure surrounding the capsid of some viruses is called the viral envelope. All viruses use some sort of glycoprotein to attach to their host cells at molecules on the cell called viral receptors. The virus exploits these cell-surface molecules, which the cell uses for some other purpose, as a way to recognize and infect specific cell types. For example, the measles virus uses a cell-surface glycoprotein in humans that normally functions in immune reactions and possibly in the sperm-egg interaction at fertilization. Attachment is a requirement for viruses to later penetrate the cell membrane, inject the viral genome, and complete their replication inside the cell. Enveloped virions like HIV (human immunodeficiency virus), the causative agent in AIDS (acquired immune deficiency syndrome), consist of nucleic acid (RNA in the case of HIV) and capsid proteins surrounded by a phospholipid bilayer envelope and its associated proteins (Figure 12.5). Chicken pox, influenza, and mumps are examples of diseases caused by viruses with envelopes. Because of the fragility of the envelope, nonenveloped viruses are more resistant to changes in temperature, pH, and some disinfectants than enveloped viruses. A) All viruses are encased in a viral membrane. B) The capsomere is made up of small protein subunits called capsids. C) DNA is the genetic material in all viruses. D) Glycoproteins help the virus attach to the host cell. The replication mechanism depends on the viral genome. DNA viruses usually use host cell proteins and enzymes to make additional DNA that is used to copy the genome or be transcribed to messenger RNA (mRNA), which is then used in protein synthesis. 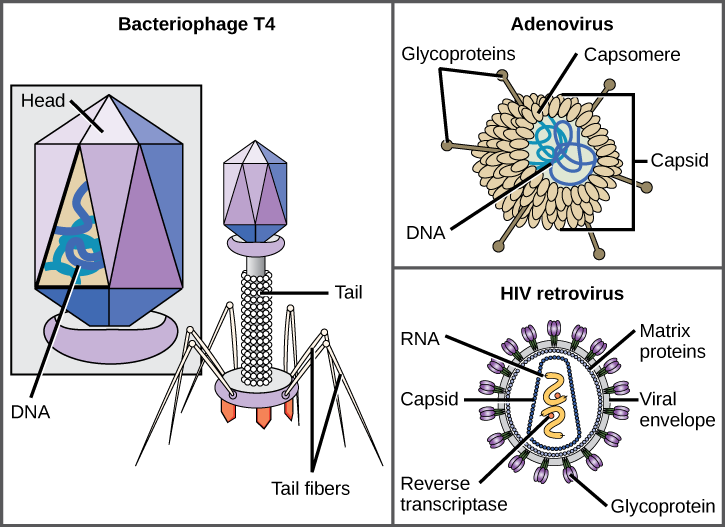 RNA viruses, such as the influenza virus, usually use the RNA core as a template for synthesis of viral genomic RNA and mRNA. The viral mRNA is translated into viral enzymes and capsid proteins to assemble new virions (Figure 12.6). Of course, there are exceptions to this pattern. If a host cell does not provide the enzymes necessary for viral replication, viral genes supply the information to direct synthesis of the missing proteins. Retroviruses, such as HIV, have an RNA genome that must be reverse transcribed to make DNA, which then is inserted into the host’s DNA. To convert RNA into DNA, retroviruses contain genes that encode the virus-specific enzyme reverse transcriptase that transcribes an RNA template to DNA. The fact that HIV produces some of its own enzymes, which are not found in the host, has allowed researchers to develop drugs that inhibit these enzymes. These drugs, including the reverse transcriptase inhibitor AZT, inhibit HIV replication by reducing the activity of the enzyme without affecting the host’s metabolism. Figure 12.6 In influenza virus infection, glycoproteins attach to a host epithelial cell. As a result, the virus is engulfed. RNA and proteins are made and assembled into new virions. 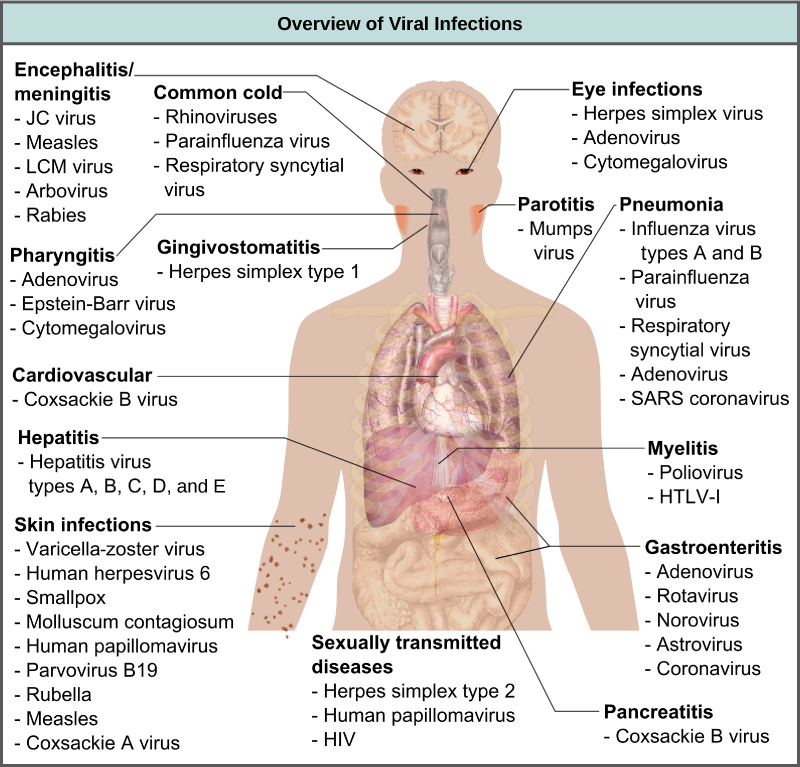 Viruses cause a variety of diseases in animals, including humans, ranging from the common cold to potentially fatal illnesses like meningitis (Figure 12.7). These diseases can be treated by antiviral drugs or by vaccines, but some viruses, such as HIV, are capable of avoiding the immune response and mutating so as to become resistant to antiviral drugs. A) All viruses are encased in a viral membrane.B) The capsomere is made up of small protein subunits called capsids. Answer: The host cell can continue to make new virus particles. A) A virion contains DNA and RNA. A) In the process of apoptosis, the cell survives. B) During attachment, the virus attaches at specific sites on the cell surface. C) The viral capsid helps the host cell produce more copies of the viral genome. D) mRNA works outside of the host cell to produce enzymes and proteins. 12.1 Viruses Copyright © by laesoph. All Rights Reserved.